This is my third entry into the Blogger Quilt Festival @Amy's Creative Side. I am entring my "Blind Co-pilot" quilt which I made for my husband in the bed quilt category. This was my long time UFO which I started in January 2013 and Finished August 2013. I totally love this pattern from Jacquie Gering and Katie Pederson's "Quilting Modern" book. This is one of my other favorite and my hybrid quilt. I really love the story of this. This was my first attempt at long-arm free motion quilting. When I went for quilting this in February of this year I was already pretty quilt with free motion quilting on my domestic machine and had a pretty good idea what I wanted to quilt on this. Blogger Quilt Festival @AmyCreativeSide is lot of fun for all the quilters to get together online. This entry is for my throw/lap quilt I made for Riley Blake's Cutting Corners College: Cute and Spooky Spider Web Quilt. This tutorial was using just the require 6x24 inch ruler no special rulers. 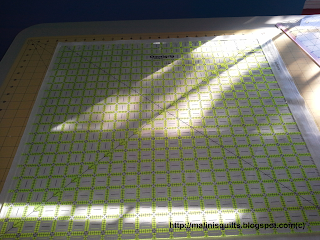 I also wrote a tutorial using the Creative Grid's Spider Web ruler using Moda's Boo Crew fabric line by Deb Strain. Check out the tutorial here. This is the modern version of the traiditional Spider web quilt. I love the asymmetry of the quilt which creates two different sizes of spider webs. Welcome to the Wicked Blog hop brought to you by Wicked Wendy and Madm Samm. Looks like I am diving from one Halloween project into the other since September. After 2 spider web quilts I wanted to do something different. How about WICKED ONE HANDLE BAG. My inspiration was the one eye monster Mike from the "Monster University" movie. There triangles where left over from the Boo-crew spider web quilt below. I don't like to waste any fabric ;). The first one is my most recent Spider web quilt just finished last week using Moda's Boo crew fabric line. This one I made it for Riley Blake Design's Cutting Corners College. It doesn't require any special ruler for this tutorial. I kind of get it how pattern designers are obsessed with their pattern. I used to wonder how come they can do the same thing again and again. Now I know. I can stop until I get this perfect. The simpler the better right? Same thing happened with Cute and Spooky Spider web quilt. 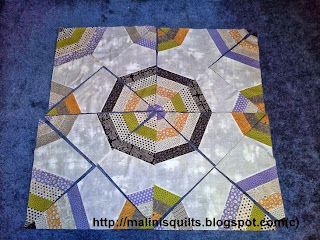 I apologize for talking about my Spider Web quilter pattern a lot lately ;). For each block we will be using one large triangle and 1 small triangle to form 2 different spider webs.